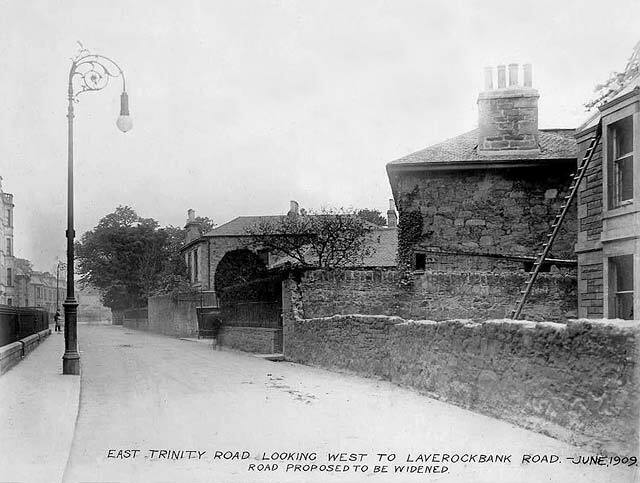 Looking west along East Trinity Road towards Laverockbank Road - June 1909 - Road proposed to be widened. Thank you to Archie Foley for allowing me to reproduce this old photograph of the eastern end of East Trinity Road at Newhaven, near Laverockbank Road, looking to the west towards Trinity. The old lamp post on the left of this photo is similar to some of the lamp posts still standing in Leith. Here is a photograph taken at Sandport, Leith on Christmas Eve, 2010. The Leith lamp posts and East Trinity Road lamp post have similar brackets, but the one in East Trinity Road has an older lamp globe fitted. The brackets fitted to all of these lamp posts are similar to some illustrated in this MacKenzie & Moncur's Street Lighting Catalogue, published in 1937. The bracket in the Trinity and Leith photos extend straight up from the pole, as does Bracket 23, illustrated top-right on the catalogue page below. However, the detail in the centre of the bracket is almost identical to Bracket 27, illustrated top-left on the catalogue page. This is one of a series of photos posted onto boards in an old album that Archie Foley acquired a few years ago. Archie believes that these are likely to be official photos that probably once belonged to Leith City Council. "East Trinity Road was in Leith until 1920 (the year that Edinburgh and Leith amalgamated). The lamp post in this picture is MacDowall Stevens column, similar to the surviving ones around Leith today. The round globe-shaped lantern would have been its original carbon-arc one."